Finally, midsize truck drivers have more viable options for a powerful, efficient, high-tech vehicle, and it all comes on the heels of the release of the 2016 Toyota Tacoma pickup truck. It has been about 10 years since Toyota re-vamped the Tacoma, so trust us when we say it is a welcome revision! Because there are not many options when it comes to picking out a midsize pickup truck in Brampton OH, the market can be extremely competitive and drivers often compare the vehicles to figure out which one would better suit their lifestyle. In the case of the Tacoma, a popular comparison that is made, especially with the release of the new model, is the 2016 Toyota Tacoma vs 2015 Chevy Colorado. Both of these vehicles are classified in the midsize pickup truck segment, but that’s about where it ends in similarities because the 2016 Toyota Tacoma is clearly the better option for drivers who want power, speed, agility and options. We don’t know a whole lot about the capabilities of the 2016 Toyota Tacoma just yet, but we do know it has an available 3.5L V6 efficient engine and a standard 6-speed automatic transmission. Power and fuel economy ratings are not yet available for the 2016 Toyota Tacoma, but we are expecting to see more details released as the release date approaches, and we are promised that the 2016 Tacoma is more powerful and efficient than you’ve ever seen. Like we said, power and fuel efficiency figures have not yet been released, but we do know that the 2016 Toyota Tacoma in Brampton ON is built for drivers who crave adventure and excitement. It comes with tons of cool available features such as a GoPro mount, Select Terrain handling system that allows drivers to choose which terrain they want to have the vehicle optimize for, a direct-and-port-injection V6 engine, a locking bed cover, a blind-spot monitoring assistance system and an upgraded infotainment system. The cabin on the 2016 Toyota Tacoma in Brampton ON is expected to be more comfortable, more efficient and more quiet. We can’t wait to see the upgraded 2016 Toyota Tacoma in Brampton ON because we are excited to see how else this outstanding vehicle can uphold its legendary name. 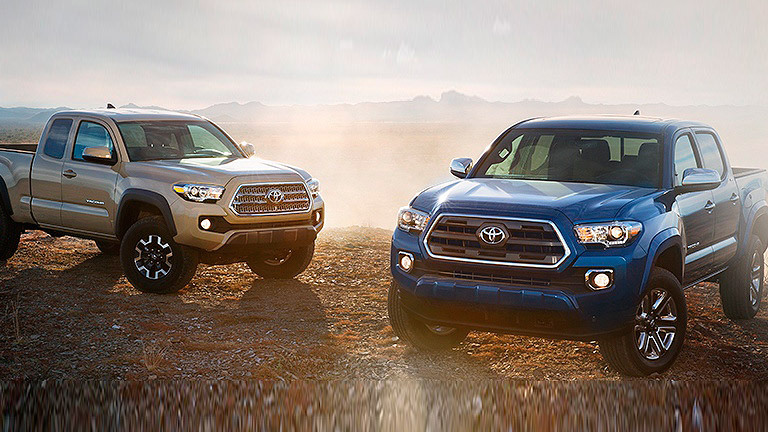 The 2016 Tacoma bulked up in the front for the new model year and became much more streamlined in the back. Every part of the 2016 Tacoma is new, from its raised hood to the locking, electric tailgate. The 2016 Tacoma is specially made for adventure and rugged excitement, which is something we’re so happy to see Toyota embrace. Check back for more information as it is released about the 2016 Toyota Tacoma in Brampton ON at Attrell Toyota!